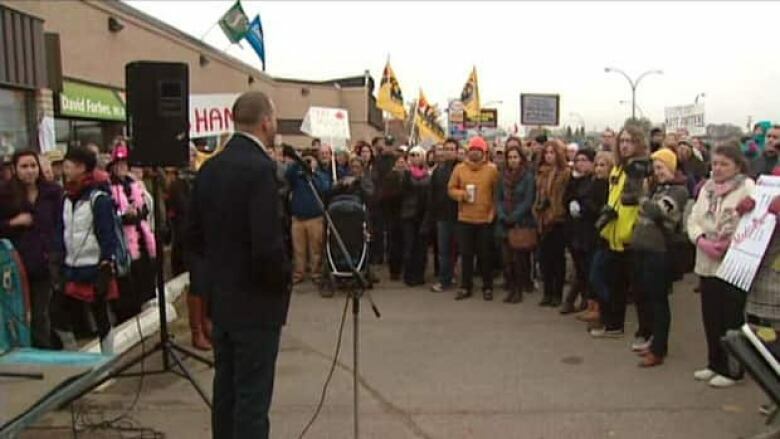 Hundreds rallied outside the Saskatoon office of Conservative MP Kelly Block yesterday to protest a controversial flyer she sent to her constituents. The Saskatoon-Rosetown-Biggar MP's flyer, mailed out earlier this month, praised the Conservative government's cuts to supplementary health benefits for refugee claimants. "New arrivals to Canada have received dental and vision care paid for by your tax dollars — not anymore," the flyer states in part. The pamphlet has sparked a lot of concern, with some people calling it racist. "I want to show my solidarity in how as Canadians, [we] uphold our belief in the access of health care to all, and how as Canadians we are compassionate people," said Jacqui Barclay, one of about 300 people who attended Saturday's rally. Block has said a draft copy of the flyer was accidentally sent out, but she defends the government's move as good policy. Law student Daniel Leblanc said the flyer is divisive. "I think it's very important for her to see that even non-refugee and non-immigrant Canadians, who on the surface may benefit fiscally from these sorts of cuts, that even we're not fully on the side of that," he said.